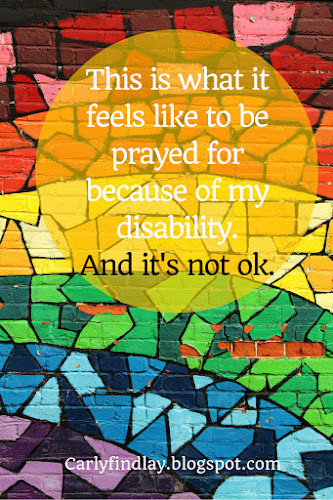 Tune into Radio Carly: This is what it feels like to be prayed for because of my disability. And it's not ok. This is what it feels like to be prayed for because of my disability. And it's not ok.
On a recent Friday evening, I finished work with the excitement of a weekend full of reading and cooking. I headed down to my local bookstore on the tram before going home. While I was on the tram, a woman offered me a seat. I smiled and thanked her but shook my head. I was only going a couple of stops. That same woman followed me out of the tram, into a small shopping mall and down an escalator. As I browsed books, she tapped me on the back and whispered "I followed you here. Jesus loves you, beautiful. Jesus loves you." This, no matter how well meaning, is not ok. Unwanted prayers are misplaced good intentions. I thanked her and looked busy. I wonder, do people pray for disabled and chronically ill people because it makes them feel better about themselves? Because they see us as objects to be pitied? Because they can't interact with us as human beings? A friend said it's because they want to spread the word of God. I guess I can see that - I occasionally recommend a product I like to a stranger in the supermarket. But it's not the same. After writing about this on Facebook, an acquaintance thought this encounter with a stranger was fine, saying I must have more faith, and that this isn't creepy. I told him, until someone makes him feel lesser, like he needs praying to be healed, I would appreciate him not determining whether this behaviour is creepy or not. He went on to say when I was young, I never turned prayers down. He said prayers helped me. I've never wanted prayers. Not ever. And prayers haven't helped. Medicine has helped. A great outlook has helped. Increased visibility of disability helped. A supportive network has helped. I encouraged him to ask my parents (who he knows) how they were treated by so called religious people when I was born. How a church leader came to dinner and told my parents they didn't believe, and that's why I still had Ichthyosis. How I felt so othered at Sunday school and youth group because they used my lack of faith and my parents' colours to justify my congenital condition. How strangers in the street do pray for me and it's made me wonder why I need fixing. How, from a very early age I've never asked for prayers or pity, and have avoided religion - rather ensuring I have strong values and ethics, and a supportive community around me. My friends with Ichthyosis tell me similar has happened to them, and it's been upsetting. "I was recently "prayed for" for the first time. I said yes because I didn't know what else to say. It made me feel ashamed, ugly, like I needed fixing, sad, hurt, awkward, used. I will say no thank you next time. This woman implied that I was less than she was. I didn't tell anyone it happened." "I once had a doctors wife tell me "our family had been cursed" and thats why my boys had x-linked Ichthyosis she then gave me holy water that had belonged to a dead priest." "I get that too. Apparently 'I am paying for the sins of my ancestors'. Whatever." And Tonia, who has Cerebral Palsy, has written a great series about the impact of prayers and religion throughout her life. It was a great read - and identified a lot with her experiences. Read that here. "There are no words in the English language that adequately convey what her words did to me. How they felt. How deeply they wounded. Nearly a dozen years later, the shock is still palpable. The anger that masks the hurt underneath is still quick to rise. To be so obviously dismissed, so clearly objectified and dehumanized at an event I had traveled eight hours and paid to attend made me feel like dirt on the bottom of her shoe. I felt unworthy to go inside. I felt like my disability meant I had to be hidden away, so I did not distract all the able-bodied people who traveled, who paid, who came to experience God here. I felt humiliated and ashamed." Friends without disabilities have told me they've been the victim of unwanted, inappropriate prayers, too. The prayers have been judgments on their appearance and sexuality. How can this be kindness? "I was 'prayed over' and told that my sins would be forgiven once in a grocery store. My 'crime'? my tattoo. so invasive." "I once had one of those 'do-gooders' tell me that Jesus hates sick homos like me & I should be ashamed!" Sadly my knee-jerk response at the time rhymed with truck off! I would be far more measured in my response these days." "I was followed by one once when I was pushing my son in a pram. She wanted to make sure I was wearing a wedding ring and that I hadn't had children out of wedlock!!" Kirstin, who also has Ichthyosis (I featured her here) has a different take on prayers. She wrote this recently, and I asked her if I could quote her. She said I could. "Working at the movie theatre here in Tuscaloosa is for the most part very much like working at the one in Salt Lake. But, there's one key difference. I regularly have people (after reading my nametag) say things like, "Kirstin, Jesus loves you" and "I'll pray for you, Kirstin" or even my favorite "I'm going to pray that God heals you." I have even had one lady ask if she could pray with me, holding my hands through the tiny window at the box office, as she just...thanked God for how beautiful I am. For the most part, I don't mind these incidents, because it's nice to have those reminders of my Heavenly Father's love. While I'm not religious, I really appreciated her way of looking at prayers and how she believes God gave her Ichthyosis for a reason. And Kirstin's is an example of religion working for her. I mentioned that I was sore on Facebook last month - before the wisdom teeth and hospital drama. Someone kindly said they're praying for me. I "liked" it, to be polite really. A reader wrote to me asking me what I think of that pray-er. I told her I'm uncomfortable with prayers, but liked it out of politeness. She made me think when she said "but by Carly liking it, others see it's ok to offer prayers". Yes, that's so true. It's only a small thing, but I clicked unlike. I don't want to be prayed for. Please remember that we often have a lot going on with our disabilities. It can take years to build confidence within ourselves. Some of us might not even be comfortable admitting to having a disability, let alone discussing it with strangers. And so to have people approach us, even through kindness, can shake our self worth. We are just trying to get on with our day. What can people who want to offer prayers to disabled strangers do? Say hello. Always say hello before launching in to what could be perceived as an awkward conversation. Don't assume that the person with a disability or visible difference is suffering. Get to know the person first, before asking about a condition or offering prayers. Help in tangible ways. Ask politely about our disability (after saying hello). Ask how you can help us - make a donation to charity, take the time to learn about our condition, tell others not to make a judgment about the quality of our lives. Never assume someone wants to be fixed or healed, or can be cured. Never assume people have the same beliefs as you. Don't force religion upon us. Don't take offence if prayers are rejected. If you must pray for us, do it in private, and don't mention it. What do you do if someone prays for you? Are you comfortable with it? While I do agree that following you to tell you that Jesus loves you and that you are beautiful is creepy and inappropriate, I'm missing where she prayed for you. There are a lot of ignorant people in the world and many of them attend church. There are a lot of intelligent/informed people in the world as well and they, too, attend church. The type of faith that says your illness/injury/condition is a result of the amount of faith you have is known as a prosperity gospel and is prevalent in TV preaching. Its also known as the health and wealth gospel. It is certainly a twisted version of Christianity and has done immense harm over the years.I want you to know, however, that when sometimes when people pray for others, it's not always for God to fix someone. My prayers (and those of people I associate with) are prayers asking for emotional and physical comfort, lessening of pain, and for an easing of burdens. That could mean financial support, accessibility issues or a break-through in medicine. I say this so that you know that not all Christians see you as someone that needs to be "fixed". Yes, Christians have a long way to go with this, but we're working on it. As a minister with disabilities, I stress not just efforts at inclusion, but invitation. Why do churches not have ramps, braille, ASL interpreters, etc. before it is needed...not accommodation but invitation. I pray for the sake of the Gospel I believe in, that situations like your prior experiences of Christendom become extinct. I am aware that my hopes will be a long time coming. Rather than pray for you, I will hope deeply that all the things you need to not just survive but THRIVE, come to you as you need them. Perhaps that is an acceptable compromis. One that doesn't offend you and allows me to express my sincere desire that you prosper. Good point Rev. Shirley about the access. Invitation not just inclusion... excellent! That encounter with a stranger is NOT fine and it IS totally creepy (shudder). I am not comfortable with people praying for me in an obvious way, that I think is all about them. As you say pray in private! I find it hard to tell people to go away (on my account - though not for others) I guess I'm just waiting for that human decency / common sense to kick in. Any minute now, they will realise that this is rude...but they don't. Oh gosh that's always an awkward situation to be in and it so so offensive. I agree with most of the people you have mentioned that we try to be kind in the moment but then we later realize that it's really insulting and degrading to be viewed as something that needs to be prayed for so we try to be geared up for a perfect response next time. And yes some people try to pray for others in order to feel good about themselves, something to testify in church.